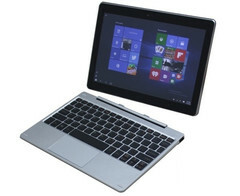 This $180 USD Windows 10 tablet with a detachable keyboard is powered by a Cherry Trail Intel Atom x5 processor, next to 2 GB of memory and 32 GB of internal storage. E Fun hits the US market with another low-cost convertible tablet that joins the Nextbook lineup. Simply dubbed E Fun Nextbook 10.1, this 2-in-1 Windows tablet has a 10.1-inch display and uses a Cherry Trail Atom processor. The E Fun Netbook 10.1 Windows 10 convertible tablet comes with Office Mobile pre-loaded and has a price tag of $180 USD on Target. The device is already in stock and ships as soon as possible.